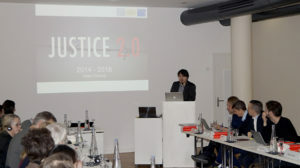 Berlin, 25 January – The recent development and history of the Platform project “Justice 2.0” was introduced by the Platform Managing Director Mr Peter Rendek at the international working conference about the victims on the Iron Curtain, which took place on 24 – 25 January 2019 in Berlin at the Max-Planck Society Harnack House conference premises. The conference was organised by Freie Universität Berlin – the Research Association of the SED State, led by Dr. Jochen Staadt. 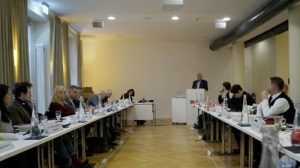 Around 30 researchers, historians, scholars, former diplomats and legal experts from Albania, Bulgaria, the Czech Republic, Hungary, Germany, Greece, Poland and Romania discussed the situation regarding the state of research regarding the victims of the former Iron Curtain. Possible future cooperation on the projects was discussed. Mr Peter Rendek from the Platform presented the state of prosecution of the cases of Germans who were killed in the course of their attempts to cross the Iron Curtain in Germany. The latest developments in the Czech Republic were presented, especially developments in the new methods and perspectives in the field of justice for victims and their rights after the Platform and the UOKG called on former East German refugees in November 2017. As of 24 January 2019, 13 former GDR citizens had been rehabilitated in cases of unsuccessful attempts to cross the borders before 1989 in Czechoslovakia and 10 other cases were in progress. The prosecutor of the Polish Institute of National Remembrance (IPN) – the Main Commission for the Prosecution of Crimes against the Polish Nation – Mr Boguslaw Czerwinski –introduced the developments in the criminal proceedings in cases of Polish refugees killed along the Iron Curtain in Czechoslovakia. 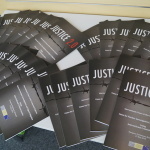 This initiative is based on close cooperation with the Platform and its Justice 2.0 project. Mr Miroslav Lehký from the Platform expert group introduced several cases of former GDR citizens in Czechoslovakia and talked about the situation as regards access to the files in the archives in the Czech Republic and in Slovakia.